What better way to celebrate spring and friends around the world than with brightly colored kites swirling and dancing against blue skies! 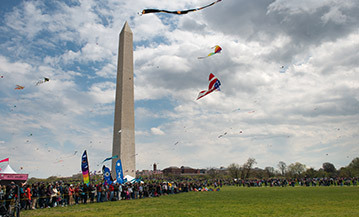 Don’t miss this day-long event featuring kite-making activities, youth kite-flying competitions, flight demonstrations by master kite makers from across the country, local kite club displays, and more! New this year, kite ballet performances will feature Team Island Quad from Victoria, BC, along with special children’s programming. Enjoy a hands-on experience with lessons in kite-flying techniques, or fly your own in specially reserved areas for public kite-flying. Plus, limited special edition Festival kites will be available for purchase at the event! Enjoy the Community Art Show featuring artwork from DC public and charter school students, grades K through 12. This year’s contest theme focuses on kimonos and how their fabric’s color and pattern show the wearer’s social status, personal identity and cultural awareness. View the top submissions from the Youth Art Contest at the Pepco Edison Place Gallery. Daily outdoor performances at the ANA Performance Stage feature captivating examples of cross-cultural exchange. At the Welcome Area, presented with the National Park Service, visitors have access to Festival information and plenty of other activities.